In his second career start, rookie goaltender Martin Jones helped ensure the Kings would come out on top by not allowing the Islanders to sniff the back of the net. After a rousing debut against the Anaheim Ducks, in which Jones stood on his head and stopped nine consecutive shots during the shootout in the Kings 3-2 win, the 23-year-old outdid himself by steering away all 16 pucks put on goal. At the 12:08 mark of the second period, center Anze Kopitar capitalized on a weak dump in attempt by the Islanders Michael Grabner, as the visitors were trying to change their lines, and put a slap shot past goalie Kevin Poulin’s high glove side to give the Kings a lead they would not relinquish. Captain Dustin Brown added his team’s second goal 10:37 into the final period and rookie Tyler Toffoli capped off the scoring on an empty-net goal with 1:04 left in the game. Casey Cizikas, Cal Clutterbuck and Brock Nelson all had two shots on goal for the Islanders. Nelson, who replaced center Peter Regin in the lineup, played in his first game since the Isles November 29th 5-0 home loss to the Detroit Red Wings. The team next plays on Monday night at the Anaheim Ducks in a 10:30 pm start. They will be looking to snap their nine-game losing streak and capture their first win on their West Coast road trip. 3 Stars- Dustin Brown- Scored his sixth goal of the season to help lead his team to victory. 2 Stars- Anze Kopitar- Put a move on Travis Hamonic and a shot past goalie Kevin Poulin to score an outstanding goal and give the Kings their first goal of the game. 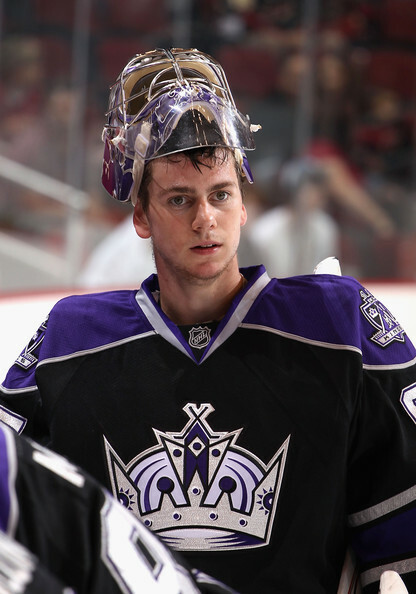 1 Star- Martin Jones- What more can you say about this young man? Follows a nine save performance in a shootout win over the Ducks with a shutout, in only his second career start.